Median household income is nowhere near the pre-Great Recession figures. According to Esri’s Updated Demographics data, median household income was $53,150 in 2007. During calendar year 2008 (the first year after the start of the recession), median household income rose to $54,700. In the intervening years, median household income fell from $54,700 in 2009 to $54,442 in 2010, and dropped in 98 percent of US counties. 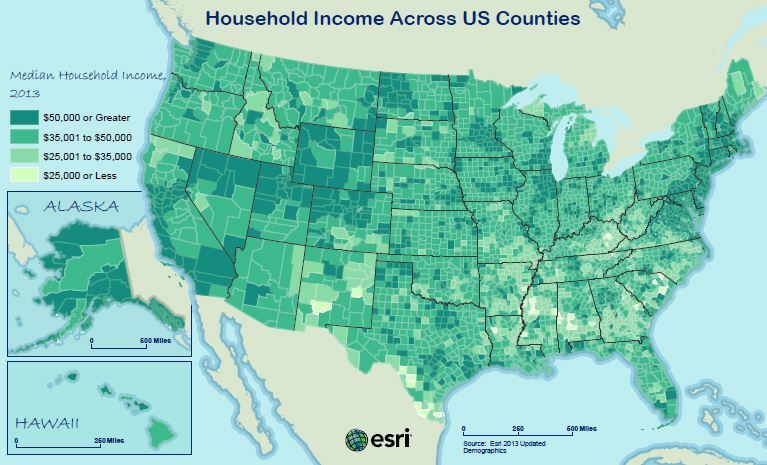 In 2013, Esri’s Updated Demographics data notes that with a figure of $51,314, median household income is still in recovery, increasing by only $1,157 from $50,157 in 2012. Where are the highs and lows of median household income in the U.S.? Four of the top ten high-income counties are in Virginia. Topping the list is Loudoun County with a median household income of $116,926 generated by a population of 339,324 living in 338,152 households. Counties in New Jersey, New Mexico, and Maryland complete the top ten. Expected high income areas are found along the Eastern Seaboard, around major cities across the US, and in coastal California. Counties in North Dakota, Wyoming, Utah, and Nevada also show healthy median income. Low income counties are spread across Appalachia and the rural South. Counties with low median household income tend to be in the rural South, and in manufacturing areas where businesses either closed or moved, taking employment opportunities away from the resident population. For example, counties in the “Rustbelt” of Pennsylvania, Ohio, and Michigan lost heavy industry and manufacturing jobs; employment in the Southern textile and furniture industries disappeared when the companies moved overseas. What are the chances of recovery? This may depend upon the availability of employment and the health of the housing market. How can you learn more about the median household income in your area? Esri’s 2013/2018 Updated Demographics data can provide some answers. Esri’s 2013/2018 Updated Demographics database includes a full roster of current year estimates and five-year projections for categories such as population, income, race/ethnicity, home value, net worth, disposable income, and more. Delivered in a wide range of geographies, formats, and variables, Esri’s Updated Demographics is available as an ad hoc database that integrates seamlessly into GIS software, and is packaged in products including Business Analyst Online, Business Analyst Desktop, Business Analyst Server, Community Analyst, and ArcGIS Online. For more information about Esri’s 2013/2018 Updated Demographics, visit www.esri.com/demographicdata.